Promotion period is from 5 January 2019 to 8 February 2019 (both days inclusive), while stocks last. 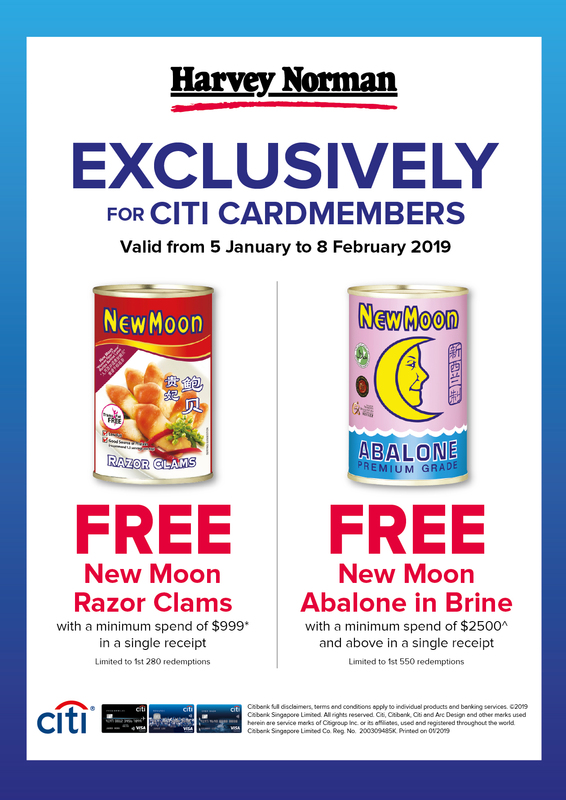 To be eligible for the Promotion, a Citi Cardmember has to charge either (a) a minimum spend of S$999* or (b) a minimum spend of S$2,500^ to his/her Citi Credit/Ready Credit Card in respect of purchases made at Harvey Norman outlets. *Complimentary can of New Moon Razor Clams is valid for the first 280 redemptions. ^Complimentary can of New Moon New Zealand Superior Abalone is valid for the first 550 redemptions. Promotion is not valid for online purchases. Promotion is applicable to full payment transactions only and not valid for Installment Payments. Limited to 1 redemption per Citi Cardmember only. Citibank's decision on all matters relating to the Promotion will be determined at its reasonable discretion and is final and binding on all participants. Citibank shall not be responsible for the quality, merchantability or the fitness for any purpose or any other aspect of the products and/or services provided by third parties and Citibank shall not at any time be responsible or held liable for any loss, injury, damage or harm suffered by or in connection with the products and/or services provided by third parties. All disputes about quality or performance of the products and/or services shall be resolved directly with Harvey Norman. Citibank and Harvey Norman reserve the right, at their reasonable discretion, to vary, add to or delete the Promotion terms and/or terminate the Promotion at any time. "Citibank" refers to Citibank Singapore Limited and " Harvey Norman" refers to Pertama Merchandising Pte Ltd.